Alrighty, as promised in last week’s WWOW, Do You Love Your Life? 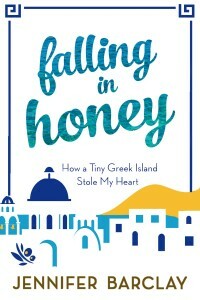 A Review of Jennifer Barclay’s Book, Falling in Honey, here is the Q&A with Falling in Honey author, Jennifer Barclay. Here are the 5 questions I had for Jennifer – and her answers. Q: I loved your book for many reasons. But I would say the number one reason is because your detailed description of living on a small Greek island depicted the exquisite simplicity of your daily life. Your story reminded me of one of my all-time favourite books, Gift from the Sea, by Anne Morrow Lindbergh. So my question to you is this: now that several years have passed, living on your Greek island, have you been able to keep that same sense of gratitude and simplicity in your daily round? Or do you find yourself getting busier and starting to long for new experiences? A: It’s a great question, as it can be hard to hang on to that appreciation, especially after three years; it’s hard not to take a place for granted, just as we can sometimes take a person for granted. But I find I’m still awed every day, and very grateful to live surrounded by such beauty; if I find myself getting too busy to appreciate it, I try to remind myself of what’s important. I’ve started taking my dog out for a walk around 7 a.m., which gives me a new appreciation for the morning when the grass is wet with dew, and golden light begins to appear on the hilltops, and in this season between Christmas and Easter I am amazed at all the colourful wild flowers changing almost daily; this morning the quick walk turned into an hour! At night I like to go out onto the terrace and look at the stars and moonlight, and listen to the gentle sweep of the waves in the bay. The view out to sea changes all the time depending on the weather. If I find I’m getting bored, it’s usually because I’m working too much – as soon as I go outside, it reminds me what an astonishing place this is to live. I think that’s probably true of a lot of places. Q: Where are you at now with your motherhood decision? Are you still planning to have a baby of your own? Do you have a child? Are you considering adoption? This question and your answer will be of interest to some of my readers, as my company made a documentary (Whatever Floats Your Boat…Perspectives on Motherhood) a few years ago about the “To be or not to be…a mom?” question, that was based on my personal struggle over the decision. A: For the last five years, my life was dominated by my attempt to see if it was still possible to become a mother; especially in the last couple of years, because three times I had the feeling of having a living thing with a heartbeat inside me for months, before I miscarried. I know it might still be possible; I have a good friend who is constantly cheering me up with stories of women who had children in their mid and late forties! On the other hand, I have spent too much of the last few years seeing doctors, putting strange drugs in my body, doing tests – I’m not someone who goes to the doctor very often, so it felt out of character – and giving up things I wanted to do. Something happened at the start of this year that made me step back and reassess, and I decided I needed some time to be me again, and to think about whether I still want it the way I did. I have always preferred the idea of adopting, but I live a very unconventional lifestyle and I think the chances of being approved are quite remote. So for now, I’m taking a breather. Q: Regarding your main love interest, Matt, in the book: considering how all that played out, do you mind sharing how you learned to trust a guy again? And, perhaps more importantly, how did you begin to trust yourself again in terms of choosing another mate? A: By the time I met Matt, I had already given up trusting myself in terms of choosing a mate, so I made sure I introduced him early on to my friends and family. They all liked him and trusted him. The sad thing is that there was so much good in Matt, and it was actually a great relationship in many ways, but there was something in his personality that made him sabotage it. I don’t think you can ever really protect yourself against that level of random behaviour. It would be like never sending your kids to school because once in a blue moon someone goes nuts with a gun. All I could do in terms of what happened with Matt, I think, is pick up the pieces and move on, be grateful that I got off pretty lightly, and hope for better luck next time. Q: As I mentioned in my blog about Falling in Honey last week, I find that the books we happen to be reading can help shape our perspectives about what we happen to be experiencing in our lives at that particular time. Since you were the editor of my book, A Widow’s Awakening, my readers might be interested in hearing how reading my manuscript (over and over again!) years ago may have shaped your perspectives at the time. A: Absolutely, I agree what we read has an effect on how we think about things we are going through ourselves, which is why I like reading books about our relationships with lovers and family. I find memoirs particularly inspiring – I don’t mean celebrity autobiographies as I don’t have any interest in those, but ‘ordinary’ people writing about the extraordinary things we all go through at points in our lives. When I read A Widow’s Awakening, I had never considered how it might feel to lose someone I loved so suddenly and at such a young age, and I found myself moved by the honest way you described your feelings and how you came through it. I think we take something with us from everything we read, somehow, even if we don’t remember the details; so reading other people’s stories about major life events is both uplifting and gives us advice on how to cope when something affects us. Q: To me, Falling in Honey was very much about falling in love with one’s life and slowing down enough to savour and appreciate the simpler things again. However, I would love to know what you would say Falling in Honey is about? What is the number one thing you wanted your readers to take away? A: Life is too short not to reach out for what makes you happy. Take some time to think about things that would make your life better. Then give them a try. Change might be easier than you think. Otherwise, to purchase a copy of the Falling in Honey, here’s the link. And to read more about Jennifer’s experiences on Tilos, check out her blog, An Octopus in my Ouzo, Life on a Greek Island. Maryanne Pope is the author of A Widow’s Awakening, the CEO of Pink Gazelle Productions Inc and the Chair of the John Petropoulos Memorial Fund. Jennifer Barclay is the author of Falling in Honey and Meeting Mr Kim: Or How I Went to Korea and Learned to Love Kimchi. 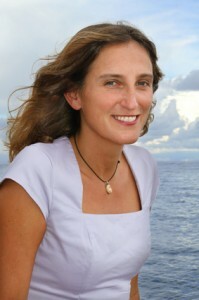 Jennifer is also an independent editor and literary agent. Please visit her website for details. Great interview. Jennifer please consider a sequel, absolutely loved Falling in Honey. I hope you never tire of your Greek paradise.